So, when I decided to write this, I had no idea that the final day of my review series would line up perfectly with the day of the BAFTA game awards. And, apparently, the fine British folks don't agree with my choices. 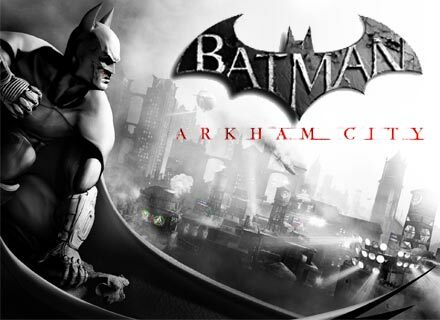 They seem to think that Portal 2 is deserving of the Game of the Year, whereas I have clearly chosen Batman: Arkham City. Ah well. You win some, you lose some. As much as I'd like to agree with the BAFTA awards, I have my reasons. All of the promotional work is black-and-white. The most important reason, as well as the most obvious one, is that Batman is awesome. Because he's Batman. However, what Rocksteady does so very well is they make you feel like you are Batman. There are several ways that they do this, but one of the most effective ways is a super subtle one. The game is a third person action game, which usually fosters a feeling of disconnect from the main character. Rocksteady manages to circumvent this by occasionally, both during the cut scenes and the gameplay, switching the camera to a first person perspective. It happens during the moments of Batman's greatest weakness or his greatest awesomeness, so it helps you identify with him. You are seeing through his eyes while he is coughing up blood, or when he is being the world's greatest detective. The game is a lot more awesome when you think that you are Batman and you are the one who is beating up dozens of criminals at a time and hunting down the super villains and solving the mysteries of Arkham City. I just recently beat Arkham Asylum (the previous game) again, and it reminded me of how good of a game Arkham City is. Arkham Asylum was a fantastic game in its own right. It rightly won awards from many, many different places when it came out. But, taking that in perspective, you realize just how good of a game Arkham City is since it made such huge improvements over Arkham Asylum. To improve so much on such a good game is truly an impressive feat. Like I said before, it's a third person action game. However, if you like to beat up on bad guys, there is no game with a better combat system in terms of pure satisfaction. You can take on dozens of enemies at once, and if your timing is good and you pay attention to your surroundings, you can come out of it without a scratch. The feeling of taking down an enemy with a shield or of hijacking a henchman who has been injected with Titan is fantastic. When you get a good combat flow going, it's truly exhilarating. Counters are great fun to pull off. Arkham City introduces the ability to counter multiple enemy at once, so you will often, in the middle of a fight, bash the heads of two henchmen on either side of you together, or hit one enemy with another enemy's body. It's all very exciting and well captured. Because who doesn't want to be Batman? One of the biggest changes from the previous game is the fact that you get to explore the entirety of Arkham City as an open world. There are no loading times between districts of the city like there was between sections of the asylum. The open world format is made possible by the introduction of better flying controls and some gadgets for ease of travel. One that you get after running through a tutorial is a grappling hook that, when you activate it, pulls you twice as fast to the ledge, and when you reach it you launch off into the sky without ever slowing down or stopping. It makes for quite speedy transport. The gliding controls have been refined to allow for actual control of your pitch in the air, and a button was introduced to initiate a dive. When you pull out of the dive, you have picked up speed, and you can actually gain altitude again. The physics of it all is quite good. Because the world is so open, the developers decided that they wanted people to explore it, so they gave incentive in the form of Riddler trophies. There are 400 trophies or riddles hidden all around the city, and it is your goal to collect them all so you can catch the Riddler. This is not the main story, just a side quest, but it actually takes more time than the story does to complete. I'm a sucker for collectibles, especially if there are achievement points tied in to their collection, so I actually invested the time to get them all. I've actually logged 43 hours playing the game, compared to 41 hours playing Skyrim (some of which aren't from me playing, but other people borrowing my Xbox). There are lots of other side quests too, which is good for taking up even more of my time. The story of the game is fantastic. Unlike Arkham Asylum, which had a very anticlimactic ending, Arkham City delivers on all fronts. The scale of it is epic, and the conclusion is all that it could be. The number of villains that are introduced is astounding, and almost all are brought to life in a way that is faithful to the source material, and yet not lame at all. Bane is kind of wrong, but we already knew that from Arkham Asylum. Arkham City brings most of the villains from Arkham Asylum back, and introduces many more. The boss fights are all great. I don't remember being disappointed by any of them, and they all feel more impressive than simply fighting another henchman. The fight against Mr. Freeze and the final fight in particular stand out as being awesome, especially on harder difficulties. If I'm going to complain about anything from the story, it's the fact that there is no coop (which I'm ok with if it means that the single player would suffer otherwise). Robin shows up in the story for a brief cut scene, but isn't playable. Nightwing doesn't even feature in the story. Both are playable in the bonus challenge mode as DLC, but you have to pay extra for that. Since Catwoman is playable in the story and the challenge mode, it would have been awesome for the other two to be in the story too, but maybe they can come in the sequel that I hope they're making. The graphics of the game are great. I'm not usually one to harp on graphics, unless it deals specifically with the engine that the game is build on. Specifically, I tend to rant about the Unreal Engine 3 vs. the Source engine. I think that I mentioned something about that during my Portal 2 write up. I love the Unreal Engine, and that's exactly what Batman is based off of. It's great, because loading times are minimal and cut scenes are beautiful. One of the cool graphical things is that, as the story progresses and the night wears on, Batman's outfit starts to get ripped, torn, and burned. He really looks the worse for wear, and you can see the toll that being in Arkham City has put on him. The voice acting is phenomenal, particularly Mark Hamill as the Joker. He always does a fantastic job in that role, so it's not surprising that he steals the show again. The voice actor for many of the characters is the same as in Batman: The Animated Series, such as Batman himself. The writers for the story were involved in writing the story for several of the comic stories, so the story is a genuine Batman story. All I can say is, at the end of the story, Rocksteady has definitely created their own universe for these games. Definitely. That unfortunately leads me to a major complaint. I hadn't really noticed until I read an article on Kotaku (it may have been IGN). It was talking about the treatment of the females in the game, specifically how the male characters refer to them. Every single female is called a b**ch multiple times by main characters throughout the story. Not only that, but the henchmen (when listening to them talk while you traverse the city) objectify the women and call them b**ches as well. Once I read the article, I started paying attention, and it happens way too often. Another problem is the perpetual problem in our culture, the difference in how the men and the women dress. All the men are wearing full clothes, while all the women show cleavage (Catwoman) or are barely wearing clothes (Poison Ivy). It really is unfortunate, and I wish that Rocksteady had gone with different costumes for the characters. 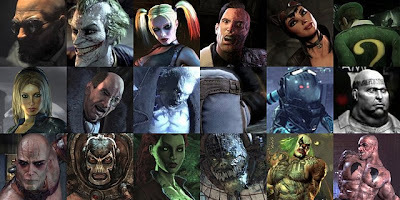 Most of the villains in the game. 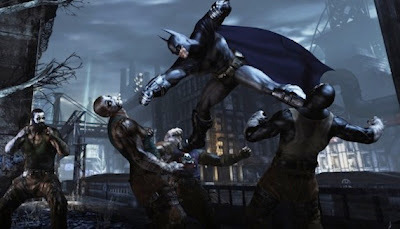 Batman: Arkham City is the most fun that I've had playing a video game in a long time. It's not perfect, but it is my favourite game of all last year, and my favourite game since Alan Wake. I highly, highly recommend it to anyone who likes action games, beating up large amounts of enemies without too much skill, and Batman fans. Which should be everyone.